There are days when you just want to munch on your favorite cookies for hours and today was one such day. 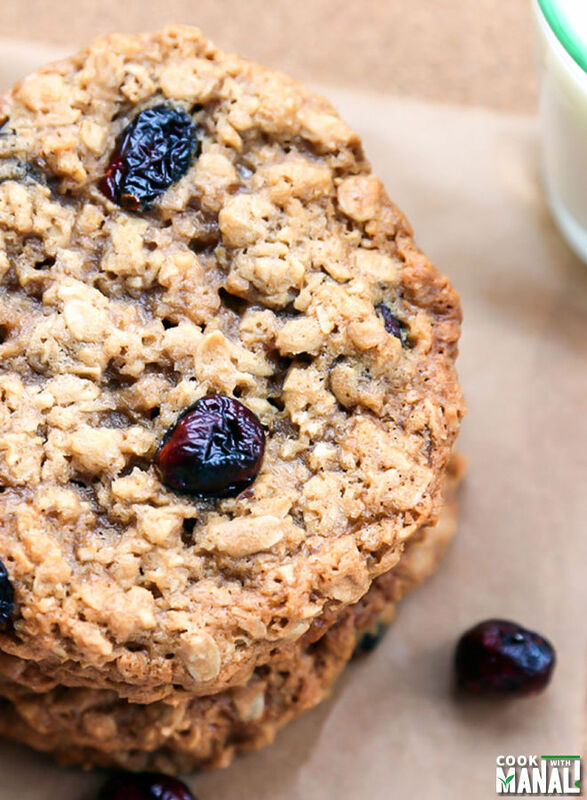 I had this sudden urge to eat a big cookie and nothing could have been better than these homemade oatmeal cookies. Yummy X 1000! They are so good! 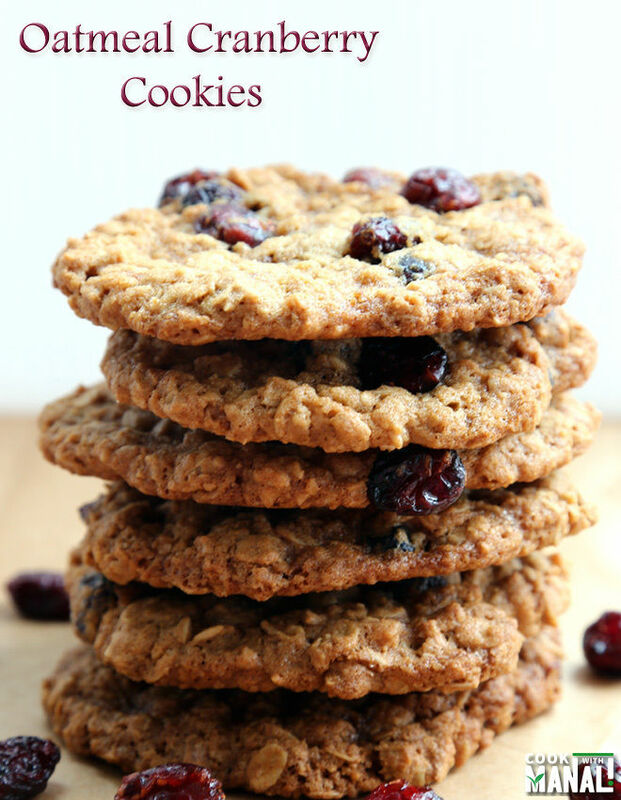 Actually the initial plan was to bake oatmeal raisin cookies but then I realized that I ran out of raisins and so used cranberries instead. 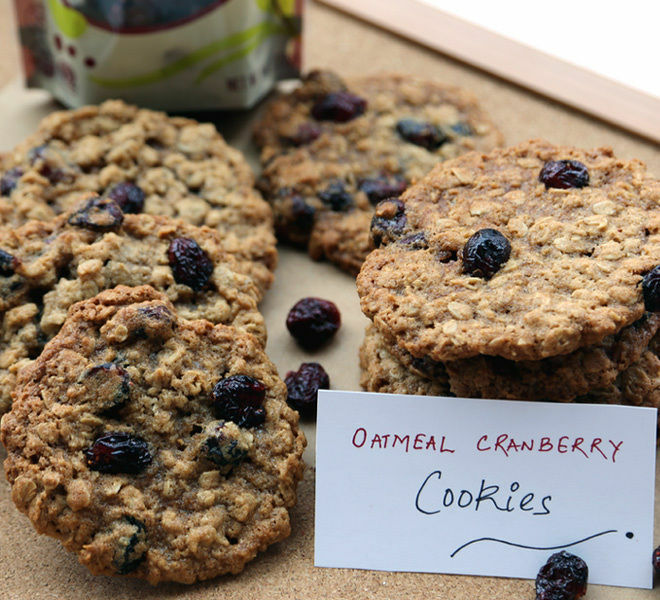 The sweetened and dried cranberries added a distinct flavor to these cookies. 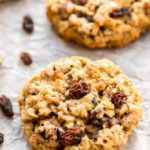 The dried cranberries that I used [Trader Joe’s] were pretty soft but in case your dried cranberries are hard, you can soak them in hot water for 15-30 minutes, then drain and then pat dry them before adding to the cookie dough. I was able to get 14 cookies out of this dough and that’s because I used an ice cream scoop to drop the dough. If you use a regular cookie scoop you would be able to get more than 2 dozen cookies. But the size of these cookies is exactly what you would get in bakery stores in USA. Yeah, everyone here loves a big jumbo size cookie. The cookie dough is pretty easy to make, you don’t even a need a mixer honestly for this. Just stir in everything together and you are done, takes only around 10 minutes. You will notice that this recipe has a higher brown sugar to white sugar ratio, that’s because brown sugar makes the cookies soft and chewy. More brown sugar = more chewiness. You can replace the whole sugar with brown sugar if you like, depends entirely on the cookie texture you prefer. 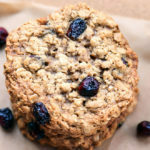 I am somewhere in between, I like chewy cookies but at the same time I love crispy cookies too so I usually use equal amount of white and brown sugar but here I used a little extra brown sugar because I love some extra chewiness in oatmeal cookies. Preheat oven to 350 F degrees. Line a baking sheet with parchment paper, set aside. In a steel bowl toss together flour, salt, cinnamon and baking soda. Add the oats and mix. In the steel bowl of your stand mixer fitted with paddle attachment or using your hand mixer , cream together the butter and both the sugars. Cream the butter and sugar for 2-3 minutes till well combined. Beat egg in a separate bowl and add to the mixture, also add in the vanilla. Beat till everything is well incorporated and mixture is smooth. Stir in the oats, mix till everything comes together. Lastly stir in the cranberries manually using a spatula. Using a cookie scoop [I used an ice cream scoop], drop around 2 tbsp of dough on the baking sheet lined with parchment paper. these cookies will spread in the oven so leave 2 inch space between each cookie. Flatten the cookie slightly with using your fingers or fork. Press 2-3 cranberries on top of each cookie, this is only for presentation purposes and you can skip this step if you don’t care about how the cookies look as long as they taste great. Bake at 350 for 15-20 minutes till the edges are nice golden brown in color. For softer cookies bake for around 10 minutes. I like slightly crispier cookies and hence baked these for around 16 minutes. The longer you bake, the crispier the cookies would turn out. Remove from oven and let the cookies cool a few minutes, transfer them on to a wire rack to cool completely. Enjoy the cookies with a glass of milk. 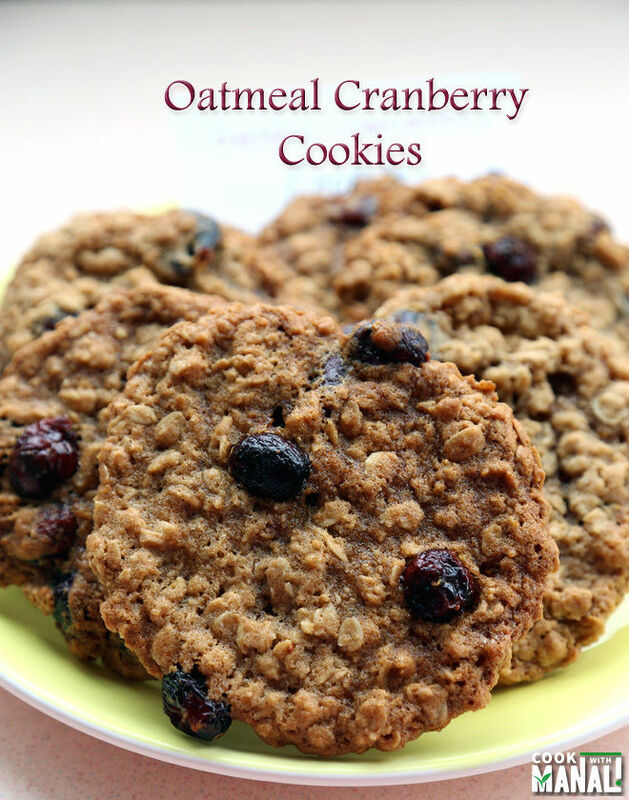 * You can replace cranberries with raisins or do half raisins and half cranberries. * Additionally nuts like walnuts, pecans can be added to the dough. 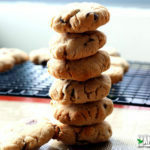 * Store the cookies in an airtight container, these should stay good for several days at room temperature. 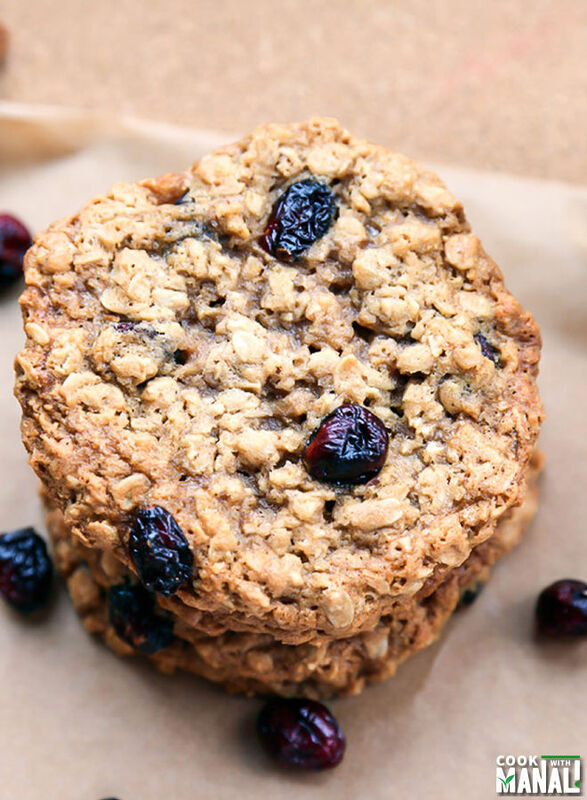 Little crispy & little chewy Oatmeal cookies loaded with dried cranberries! In a steel bowl toss together flour, salt, cinnamon and baking soda. Add the oats and mix. In the steel bowl of your stand mixer fitted with paddle attachment or using your hand mixer, cream together the butter and both the sugars. Cream the butter and sugar for 2-3 minutes till well combined. Beat egg in a separate bowl and add to the mixture, also add in the vanilla. Beat till everything is well incorporated and mixture is smooth. Stir in the oats, mix till everything comes together. Lastly stir in the cranberries manually using a spatula. Using a cookie scoop drop around 2 tbsp of dough on the baking sheet lined with parchment paper. leaving 2 inch space between each cookie. Flatten the cookie slightly with using your fingers or fork. 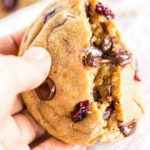 Press additional cranberries on top of each cookie [optional]. Bake at 350 for 15-20 minutes till the edges are nice golden brown in color. Remove from oven and let the cookies cool a few minutes,transfer them on to a wire rack to cool completely. Hi Manali loved these cookies. Planned to do but just a thought flashed can i use olive oil instead of butter. nowadays i am making all muffins and cakes with olive oil that’s y thought whether this will suit this too?? Thanks manju! 🙂 I am not sure how olive oil would taste in cookies…. butter gives the cookie its taste and texture so not sure how it would taste without it..I guess the oil would make the cookies greasy and dense.. I would suggest replacing half the butter with oil….or you can do half butter and half applesauce/bananas. 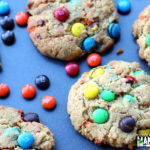 Let me know if you try making cookies with 100% oil, maybe I can also give it a try next time! The cookies look delicious and wanted to try them out. Thanks Julie for the tip! I know flax seeds can replace eggs but I have never tried it personally. Will give it a try next time! I made the cookies with ripe banana instead of the egg. The cookies came out very well. Yay! 🙂 So glad u liked it and u are welcome 🙂 btw I can’t see the pic… not opening!